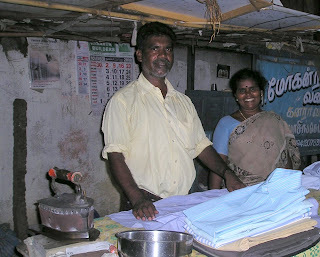 Samiam and Nagaraj are our local ironers. Most clothes here are cotton and we dry them on a line so they are pretty wrinkled, even people who don't have shoes get their clothes ironed. Samiam is a Growing Opportunity Client. She takes the loan and applied it to the ironing business. She works 7 days a week from 8 am to 10 pm. They have 2 carts and employ 2 other men. There is no electricity in their carts, the men use heavy irons filled with homeade charcoal. Samiam goes to peoples houses and picks up their ironing which is shirts, pants, saris, bed sheets, hankies ect. The charge is 2.5rs ($0.06) for each shirt, we average 14 pcs a week. Samiam is such a neat lady. Every time she sees me she asks where Anna is. She worries when Anna is sick. We don't speak each others language but we are friends. Anna understands what she is saying and sometimes does translate for me. She has 3 kids, one son in Palavarum college learning carpentry, a daughter in nursing school and one son in 8th standard. Keep her in your prayers. She is like many Hidus here, she does pray to Jesus too. She is currently asking Jesus healing on her neck and feet of sharp pains. She hurts due to all the weight she caries on her head and most of the time she isn't wearing shoes. The doctor are expensive here 100rs ($2.50) and are not really able to help her.